999 Fine Proof Silver Marvel Avengers: Age of Ultron Set of 5 Coins (Original Mint Packaging with Captain America COA) SKU37334. 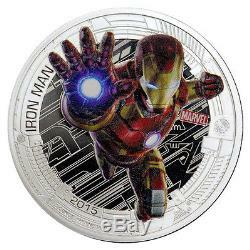 Proof Colorized Silver Marvel Avengers Age of Ultron - Set of 5 Coins to your colleciton? The Marvels Avengers film saga is based on the Marvel Comics universe by Stan Lee and Jack Kirby. Since the debut of the Marvels Avengers comic book in 1963, the Avengers have maintained worldwide popularity. In May of 2008, Marvel released the Iron Man film, which was an instant hit at the box office. Since 2008, Marvel has released over a dozen films, which explain the background of each character and lead up to the assembling of the Avengers. This series commemorates the Marvels Avengers: Age of Ultron film that was released in May of 2015. 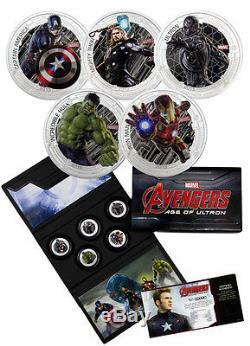 This five coin series contains a coin for Iron Man, The Hulk, Captain America, Thor, and Ultron. 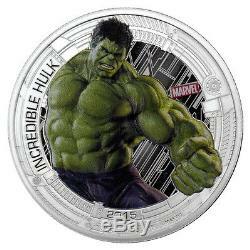 The reverse of each coin bears a colorized portrait of a Marvel Avengers character in a fighting stance. Each coin has an inscription of the characters name, as well as 2015, 1 OUNCE. The obverse of each coin bears an image of Her Majesty, Queen Elizabeth II, by Ian Rank-Broadley. The obverse is inscribed with, ELIZABETH II, NIUE, TWO DOLLARS, 2015, as well as the artists initials, IRB. 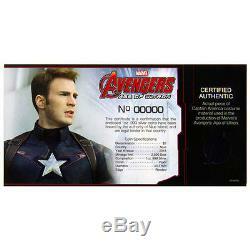 Not only does the certificate of authenticity contain coin specifications and a serial number, the certificate contains an actual piece of Captain Americas costume material that was used in Marvels Avengers: Age of Ultron! 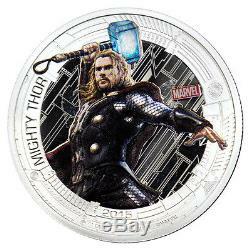 With the growing popularity of the Avengers and the highly anticipated film releases, these coins are sure to sell quickly! Avoid missing out on this once-in-a-lifetime opportunity and place your order today! Precious metals markets are fluid. Offers are not accepted unless you see the "Make Offer" feature within the listing. There are no quantity discounts - final and current price is always as stated within the listing. On certain items we offer a separate "lot" or "roll" product for sale at a discounted price. We cannot make any price adjustments after the sale is complete. Please make sure your order is accurate before paying, once an order is placed it cannot be modified. At our discretion we may choose to combine certain orders. At our discretion, we may opt to self-insure any order. We will investigate all claims and prosecute in the event of fraud. We will attempt to contact you to see if you would like us to resend the order. INTERNATIONAL ORDERS POLICY: We are accepting international orders from select countries. These charges are the customer's responsibility. However, we cannot guarantee that we can always do so due to the volume we deal with. We only combine orders placed consecutively the same day. Combined order requests must be made prior to order processing. They have been determined as the best rate to cover all possible sizes and weights. Please note that bullion coins, bars, and rounds are mass-produced and are not struck to the same quality standards as collector coins. We will ONLY contact you regarding your current order. We do not include, stock, or sell OGP/COA, capsules, or other storage devices. If OGP, COA, or any other type of box or storage device is included it will be specifically stated within the listing. We only sell for the current price stated within the listing. Prices do fluctuate daily based on market and other factors. We do not accept offers or have quantity discounts unless specifically sated within the listing or the "make offer" button is featured. All precious metals are measured in Troy Ounce whether the listing title and description or coin design mention it or not. We can file a claim on any order where the tracking information shows the package as not delivered. We are no longer responsible for any order where the tracking information is marked as DELIVERED - we are unable to file a claim on any order marked as delivered, you will need to contact your local postal carrier's office in order to seek resolution. Missing or Wrong Item in Order. 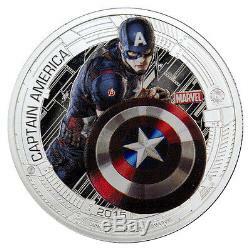 The item "2015 Niue $2 1 Oz Proof Silver Avengers Age/Ultron Set-5 (Capt Am COA) SKU37334" is in sale since Tuesday, November 03, 2015. This item is in the category "Coins & Paper Money\Coins\ World\Australia & Oceania\South Pacific". The seller is "mcm" and is located in Sarasota, Florida. This item can be shipped worldwide.